As you may have already figured from my Zoku Duo Quick Pop Maker review in the midst of Gaming Month, I’m not really much of a gamer. Not since 1995, anyway. But the show must go on, and even a gaming-ignorant like me likes playing some games. I was all set on writing an in-depth review on Temple Run 2, when I found something even cooler. The Sifteo Cubes. Part LEGO, part dominoes, part video game; these cubes try to fuse the games my generation enjoyed as kids (e.g., building blocks, puzzles, LEGO, etc.) with today’s video games, creating a video-board game of sorts that’s happening inside several cubes at once. If this is a little hard to grasp, don’t worry, I’ll show you exactly how it works. But are the Sifteo Cubes really all they’re cracked to be, or is this no more than a gimmick? To find out, we bought a new set of Sifteo Cubes and I set out to perform the toughest part of my job: playing games. The results are in front of you. But as usual, it doesn’t end there — one lucky reader will win this $130 set of Sifteo Cubes, and will never be bored again! Read on to find out how you can win and to enter the giveaway. What Are These Sifteo Cubes? If the name Sifteo Cubes sounds slightly familiar, it might be because of this somewhat viral TED Talk, where co-founder Dave Merrill presented one of the early prototypes of the Sifteo Cubes — then called Siftables — to much enthusiasm and success. This was back in 2009, and today’s available model of the Sifteo Cubes is a much-improved one, and can be purchased from the company’s website, Amazon, etc. So what are these cubes all about? The Sifteo Cubes are 1.7-inch (approx. 4 cm) squares with a small LCD touchscreen. They come with the Sifteo Base, which is the unit that actually runs the games, and also plays the music that goes along with your game. The Sifteo Cubes come equipped with 3-axis accelerometers and proximity sensors, which in plain language means they can respond to motion, and also detect the proximity of other cubes. Each Sifteo game makes use of several cubes, with gameplay involving moving the cubes around, connecting them to each other in various ways, and completing goals in that manner. The basic Sifteo Cubes pack, and the one I purchased for this review, consists of three Sifteo Cubes, along with the base and other small additions we’ll get into shortly. This set sells for $130 through their Amazon. It’s also possible to buy a single add-on Sifteo Cube to expand your set. The more Cubes you have, the more interesting the games become, and there are also some game modes that are only open to 4 cubes and up. An add-on Sifteo Cube sells for $30 from Amazon. If you want to go all out, you can get the full, 6-cube set for $200. While there are many games around that combine a physical toy with smartphone control, or utilize accelerometers and proximity sensors, there isn’t anything around that’s just like the Sifteo Cubes, with their actual video-game LCD screens built right into the toy. At least, I couldn’t find anything similar. If you know of a similar game, I’d love to hear about it in the comments. The Sifteo Cubes Intelligent Play System comes in an attractive box, with every possible eye-catching element in the book. The flip side of the box includes an additional photo of the product, icons for included games, illustrations for all available Sifteo Cubes movements and actions, and even a QR code you can scan to “watch Sifteo Cubes in action”. Pull it all the way through, and you’ll find the other half of the box, with little “pull me” and “open me” tags, which you may find hard to resist. Good thing you don’t have to! Inside the bottom part of the box is everything else you’re going to need to run your Sifteo Cubes system, all tucked up nicely in a way you’re never going to be able to replicate after you take them out. Well, almost never; I’m obviously going to do this with my box, so one of you can also enjoy this efficient and beautiful packing. Good thing I photographed it. One Sifteo base, required for running the games. One micro-USB cable, for connecting the base to your computer. Six AAA batteries, which is the required number to run the entire system. One neatly packed carrying bag (the orange box). One short yet informative quick start guide. One Special Code for a free game (which the winner of this set will get!). Four preloaded games, plus one demo game. With everything present and accounted for, it’s time to set things up and start playing! Before you race head-on to playing a game, it’s good to get to know the system and its different parts, and learn how to operate it. Inserting the batteries would also be a good idea. Each Cube takes one AAA battery, while the Sifteo Base requires two of them. Each Sifteo Cubes comes with two blue stickers on it. These can be easily removed, but they’re actually kind of useful. You see, Sifteo Cubes may look symmetrical, but they actually have a set orientation. Yes, they can sense movement, but the screen never changes its orientation. The blue sticker you can see here on top signifies the bottom of each cube. The little arrow, aside from pointing in the direction in which you have to pull off the battery cover, also points to the top part of the cube. Orientation becomes immediately apparent when these are turned on, so the stickers aren’t entirely necessary, but they’re useful. The cubes themselves are covered with sturdy white plastic, so they won’t easily scratch or break, and each weighs a measly 38g (around 1.5 ounces). The Sifteo base is where you turn the cubes on and off, it’s where you can pause games while playing, it’s the source of the music and sounds effects that come with each game, and it’s also your only way to download new games for your cubes. The base is also covered with the same white plastic all around, with the top part being an adequate speaker for its purposes. The base is also very light, weighing at around 70g (around 2.5 ounces). The base has only one button — the one you can see in the photo above. Pressing this button turns the system on, and a long press turns it off. If you give the button a short press while the system is on, you’ll pause the game you’re currently playing and open up a menu on one of your cubes for resuming or quitting the game. The base also comes with a nice volume slider, for controlling the aforementioned music and sound effects, or for muting them entirely. The cubes are equipped with a 2.4 GHz wireless radio, which is how they communicate with the Sifteo base. This means the cubes and base have to be in relatively close proximity to each other when playing. While I did manage to play with the cubes with the base around 3 meters away without a problem, it sometimes failed completely when it was only 50 cm away. Since the parts don’t take much room anyway, the best way to go is to play as close to the base as possible. With the parts being so small and light, it’s easy to take the system with you to play on trips, at friends’ houses, at work, or wherever you feel like it. The carrying case that comes with the system is nothing more than a simple, branded cloth bag, without any extra padding, so don’t drop the bag with everything in it. While the screen is touch sensitive, you cannot navigate menus by sliding your finger on them. This is done solely by tilting the cube from side to side. Every time you turn on the system, one cube will take upon itself to be the menu cube. You need to use this cube to select a game, quit a game, etc. In some games, the cubes only work in their correct orientation. This can get confusing at first, as you might not understand why the cubes won’t “connect”. With these thing in mind, which I learned the hard way, you’re more than ready to start playing. To turn on the system, press the button on the base, and watch as your cubes come to life. Pick up the menu cube, and start tilting it from side to side to choose your game. Chroma Splash: a Sifteo take on classic match 3 games. Cube Buddies: a face-building puzzle, mainly for kids. Code Crack: a math game for both kids and adults. Word Caravan: a word game where you have to create words from a jumble of letters. Sandwich Kingdom Demo: a quest-like game. Code for full version included in box. Don’t be fooled by the way these games sound, most of them can get pretty challenging pretty quickly, even for adults, so this is not strictly a kids’ toy. If you tilt the menu all the way to the end, you’ll find some useful information about your Sifteo system such as battery indicators, a free-space indicator, and the number of cubes currently connected to the base. And now we’re finally ready for the really interesting part: the games! The Sifteo Cubes’s tiny LCD screen have surprisingly good viewing angles, with the game visible from almost any angle you look at it, even upside down. The games, however, are of mediocre quality and graphics, which remind me of video games from 15 years ago. It works well with the retro feel of playing with blocks, though. Most games also take quite a long time to load and when I say long, I mean anything from 5-15 seconds, which might not sound long, but in today’s standards certainly feels long. Since explaining the gaming experience of the cubes in words can take forever, and will never really convey the experience of actually playing with them, I made some short videos to demonstrate what it’s like. Don’t think all levels are this easy, though, I couldn’t very well film myself failing to complete a level! In most games, you can get hints by tapping the screen while playing. An example for how these hints work can be seen in the following video. At any point in the game, press the button on the base to pause the game. As mentioned earlier, this will cause a new menu to pop up on the menu cube, which you can tilt around to resume or quit the game. While the gaming experience is usually smooth, I did encounter some bugs while playing. Several times, one cube would suddenly get disconnected from the base, although the distance had not changed. In most cases, this corrected itself right away, but in one case, the cube lost connection and could not find it again. One time, my entire set suddenly turned off after losing connection, forcing me to restart the system. The games themselves sometimes have bugs too, such as a wrong calculation in Code Cracker, but these are not common. It also happens that the cubes don’t recognize your touch very well, making you tap several times to get a response. The Sifteo Cubes system comes preloaded with 4 games, all pretty nice ones, but it’s still only 4 games. How do you get more? In order to update existing games, get new ones, and sync your Sifteo base, you’re going to need to download Sifteo Sync — a free desktop software available for Windows and Mac. According to the program’s download page, “Windows 8 compatibility [is] coming soon”, but I managed to run SifteoSync on my Windows 8 machine without apparent problems. In order to use the program, you’re going to have to create a Sifteo account and log in, all of which can be done from within the program. So what does Sifteo have in store for you in Sifteo Sync? In truth, not much. Aside from the games you already have, there are eight more games to be had. One of them, called Bliss Bomb, is the only free one, and is not really much of a game, but more of a music and color presentation. To get the rest, which include a Teenage Mutant Ninja Turtles game and some other indie games, you’re going to have to buy credits. You can either get the Indie Game Pack which includes 3 games for $12, or pay $5-$12 per available game. Connect your Sifteo base to the computer with the provided cable to add and remove games, automatically update games you already have, and keep your firmware up to date. After playing with these cubes for quite a while, I’m still pretty ambivalent towards them. On the one hand, the Sifteo Cubes provide an innovative and fun experience, which is also surprisingly addictive. Every time I decided to leave them alone, I felt called back to play some more. The games are very simple — nothing I’ve never played before — but the cubes make these old games interesting and exciting again in a way I hadn’t expected. On the other hand, this is a $130 system, which is by no way cheap or even affordable when compared with other gaming systems. When looking at a full hand-held device such as the Nintendo 3DS XL Nintendo 3DS XL Review and Giveaway Nintendo 3DS XL Review and Giveaway Among all the big names in gaming consoles, Nintendo is definitely among the top favorites. As a '90s kid, I associate much of my childhood with playing Nintendo games. I remember growing up with the... Read More , which costs $200, the Sifteo Cubes seem even more expensive. They do come with four games, which is really nice, but additional games cost $5-$12, which feels a bit steep, considering I could get mobile games that are much more engaging and beautiful for less. While the system is generally great, I did encounter some bugs while playing, which added to my general disillusion. When push comes to shove, though, I can’t bring myself to really say anything negative about the Sifteo Cubes. They’re fun to play with, the games are engaging enough, and the system does combine video games with physical toys beautifully. With its price tag, I’m not sure it could compete with other offerings on the market, but if the idea appeals to you, this is a fun toy to have. MakeUseOf recommends: If the idea appeals to you more than other available options, buy it. How do I win the Sifteo Cubes? The giveaway is over. Congratulations, Chris Coppenbarger! You would have received an email from jackson@makeuseof.com. Please respond before May 22 to claim your prize. Enquires beyond this date will not be entertained. This giveaway begins now and ends Friday, May 10th. The winner will be selected at random and informed via email. This review contains affiliate links, which pays us a small compensation if you do decide to make a purchase based on our recommendation. Our judgement is in no way biased, and our recommendations are always based on the merits of the items. Poket size Crazy Gaming.. Fun to play with..
sure would be nice to win would nice to win would give me something to do while I am home bound from my recent hip replacement. Good Luck y'all!! it would n be nice tho win it would give me something to do while I am home bound from my hip replacement I am board to death puzzle books are getting old and reading Is too. good luck to y'all. Thanks for the Sifteo Cubes Inteligent Play System giveaway. My daughter thought they were "Super"
These do seem pretty cool. I could really see myself really getting into them but getting board very quickly. One think I would say though is that they should focus on making games. So many companies have failed because they focus on the having the best hardware, but they forget games sell the hardware. I mean look at sega or n-gage. Great article by the way. I completely agree, the weakest point in this system is the lack of games and their price. These are so cool! I'm not much of a gamer but I was an old school gamer back in the day so these are a great way to reconnect. That's great to hear, thanks Peter! Thanks for the detailed review! However, I am passing on trying to win it. My most basic reaction is "meh". Maybe I am being unfair but I will show this review to my 10 year old grandson (the gamer in the family) and get his reaction. He is a whiz (and I am not exaggerating) at Legos and amazes me with the items he creates just out of his head. He made a gun (yeah, I know - not PC right now) complete with trigger and ammo clip. No pattern - but got the idea on You Tube. He just blows me away with his ability to see how to make stuff in his head. They are just bricks to me. :) I'll let you know what he thinks! I'm looking forward to hearing what he had to say! I think these are the coolest things. Great way to pass the time! Love the idea of this cool gadget :) If I have a child, I will get 1 for him. I don't want email about giveaways. There are too many. I only want makeuseof information. Thanks for your feedback. We hear the feedback and will be making some tweaks to send out less newsletters that focus on the giveaway as the main features story. We'll still keep our subscribers informed of giveaways, but we'll try to focus more on other content. 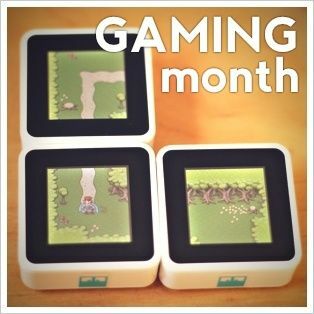 cool.. most of games are moved on screen but with these cubes you must do a bit more than a click :) and great design! These seem like they would be good conversation starters for guests to play during a visit. Achievements are a big draw for any gaming right now. I wonder if they would be incorporated into the cube games. I also wonder about the "Brain exercise" fad, if they could market them towards that, might have greater success. would like to try these cool looking gadgets. Pretty cool, I have a Yahtzee game that uses a similar cube tech and it's fun. The biggest factors are the cost and support, $99 is a better price point. It also has to compete with IOS and Android games which are as low as $0.99. Entered. Though, there is no code on the FB post. However, being as simple as it is, I guessed at "cubes" and it worked. Thanks for the chance to win MUO!!! Hey thanks for the information . Sure do appreciate it will take cue on the next give away. Great giveaway these are brill so count me in & thanks.